This recipe is slightly different from Aloo Zeera or North style pyaz aloo ki sabzi recipe. 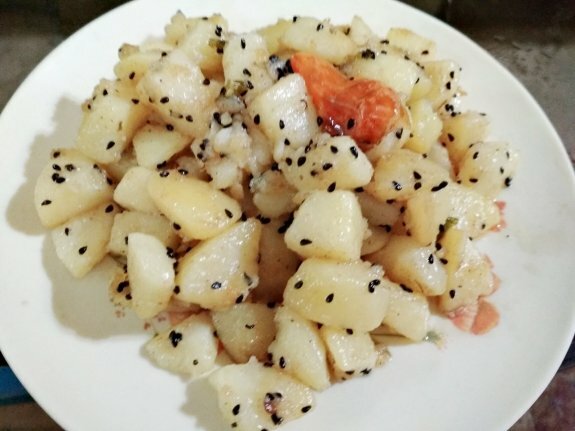 In this recipe you will get the total flavour of nigella seeds or Onion seeds and green chillies. One of the easy to make quick recipe that you can have with roti, naan, paratha or even with rice and dal also. 1. Heat oil in a pan and add one spitted red chili and 2 tsp Kalonji. 2. Now, add half boiled cubed potatoes and stir fry it for about 3-4 minutes. 3. Add 1 or 2 Tbsp warm water if required. However, I did not use any water while frying the potatoes. 4. Now add chopped green chillies and Salt and mix everything well. 5. At last add black pepper powder and Chaat Masala powder. Mix everything and serve it hot with roti, paratha, rice or naan.